Matmor Formation (foreground and middle ground) in Hamakhtesh Hagadol, Israel. The Jurassic Matmor Formation is the name given to the thick 100 meter unit that is exposed in Hamakhtesh Hagadol. The Matmor Formation contains fossils from a Jurassic equatorial shallow marine environment. Bivalves, gastropods, sponges, corals, echinoderms, and sclerobionts are present in the Matmor Formation to various degrees (Wilson et al., 2010). The stratigraphy of the Matmor Formation consists of alternating layers of limestone and marl (Hirsch and Roded, 1996). The Iraq Petroleum Company originally described the Jurassic sequence in Hamakhtesh Hagadol of Israel in the 1930s (Hudson, 1958). These findings were later described and published by Blake (1935). Shaw (1947) published a limited summary of the stratigraphy. Hudson (1958) later subdivided the rocks into the Callovian, Divesian, Argovian, Sequanim biostratigraphic stages. In 1963, Goldberg subdivided the section into the Zohar, Kidod and Be'er Sheva formations. Goldberg (1963) further divided the Zohar formation into the Ziyya and Madsus members. In 1966, Mayac dated the Callovian and what appeared to be the Lower Oxfordian stages with forams (Mayac, 1966, in Hirsch and Roded, 1996). Further biostratigraphic work by Hirsch et al. (1998) and Grossowicz et al. (2000) show that the Matmor Formation is entirely Upper Callovian. Goldberg, M. (1963). "Reference section of Jurassic sequence in Hamakhtesh Hagadol (Kurnub Anticline). Detailed binocular sample description, including field observations." Israel Geological Survey, Unpublished Report, pp. 1–50. Grossowicz, L.P., Bassoullet, J.P., Hirsch, F., & Peri, M. (2000). "Jurassic large Foraminifera from Israel." Geol. Surv. Isr. Current Res, 12, 132-144. Hirsch, F., Bassoullet, J. P., Cariou, E., Conway, B., Feldman, H., Grossowicz, L., Honigstein, A., Owen, E. and Rosenfeld, A. (1998). "The Jurassic of the southern Levant. Biostratigraphy, palaeogeography and cyclic events." In: S. Crasquin-Soleau and E. Barrier (eds. ), Peri- Tethys Memoir 4: Epicratonic basins of the Peri- Tethyan platforms. Mem. Mus. natn. Hist. nat. 179: 213-235. Hirsch, F.; Roded, A. (1996). "The Jurassic stratigraphic nomenclature in Hamakhtesh Hagadol, northern Negev". Geological Survey of Israel, Current Research. 10: 10–14. Hudson, R.G.S. (1958). "The Upper Jurassic faunas of southern Israel". Geological Magazine. 95 (5): 415–425. doi:10.1017/S0016756800062993. Wilson, M.A. ; Feldman, H.R. ; Krivicich, E.B. (2010). "Bioerosion in an equatorial Middle Jurassic coral-sponge reef community (Callovian, Matmor Formation, southern Israel)". Palaeogeography, Palaeoclimatology, Palaeoecology. 289: 93–101. doi:10.1016/j.palaeo.2010.02.019. Marls and limestones of the Matmor Formation exposed near the center of Makhtesh Gadol. Gastrochaenolites boring in a coral from the Matmor Formation. Calcarea sponge and encrusting crinoid from the Matmor Formation. Scleractinian coral from the Matmor Formation. Paracenoceras, a nautiloid from the Matmor Formation. 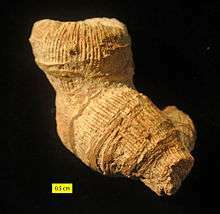 Enallhelia, a scleractinian coral from the Matmor Formation. Fimbria sp. 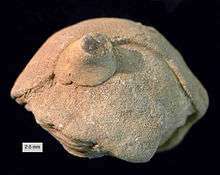 ; a bivalve from the Matmor Formation. 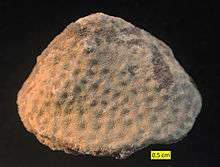 Amphiastrea Etallon 1859; a scleractinian coral from the Matmor Formation. Axosmilia, a scleractinian coral from the Matmor Formation (Middle Jurassic) of southern Israel; side view. Axosmilia, a scleractinian coral from the Matmor Formation (Middle Jurassic) of southern Israel; oral view. The scleractinian coral Microsolena from the Matmor Formation, Middle Jurassic, southern Israel. Epistreptophyllum, a scleractinian coral from the Matmor Formation (Middle Jurassic) of southern Israel; side view. Actinostreon spp. 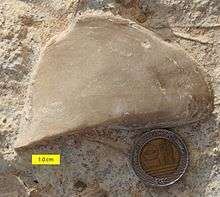 from the Matmor Formation (Middle Jurassic, Callovian) of Makhtesh Gadol, southern Israel. Mytilus (Falcimytilus) jurensis from the Middle Jurassic (Callovian) Matmor Formation of Makhtesh Gadol, southern Israel.